Love the smell of tomato plants? So does dodder, a parasitic plant that eats plant-kingdom stereotypes for lunch. Dodder isn't green. It has no use for roots. It doesn't make sugar or exploit solar energy. And rather than growing up to be a responsible, contributing member of society, it's pure parasite. Dodder (Cuscuta pentagona) attaches to the stems of host plants and extracts fluids and sugars. With few chloroplasts and no leaves, dodder must find its target soon after the seed sprouts, since the seeds have only enough energy to grow a few centimeters. A seedling of the parasitic plant Cuscuta pentagona attaches to a tomato plant. Courtesy Justin Runyon, De Moraes and Mescher Labs. So how does dodder dodder over to its hosts? By using its "nose," that's how. Scientists have long known that plants communicate via odors: flowers attract bees, other pollinators, and even human beings through their scents. When plants are eaten by insects, they seem to release volatile compounds which stimulate nearby plants to produce toxins and deter further insect attack. And now it appears that some parasitic plants exploit chemical signals in their search for a host. A research team headed by Consuelo De Moraes and Mark Mescher, assistant professors of entomology at Penn State University, placed dodder seedlings on dishes next to a source of volatiles — damp soil, a tomato seedling, or parfum d'tomato (an extract of volatile compounds from tomatoes). When damp soil was nearby, dodder grew in random directions. But dodder grew toward a tomato plant — and toward a blotter full of tomato extract. Reminds us of a pipsqueak version of the giant anaconda slithering toward Jane in a cheesy "Tarzan" remake. Dodder, considered one of the top 10 weeds in the United States, also attacks asparagus, beet, carrot, eggplant, garlic, melons, onion, pepper, potato and sweet potato. Host plants may weaken or die during an outbreak, depending on many factors. Having a wide range of hosts makes you more adaptable, and indeed dodder can be found around the world, the researchers say. Counting plants that may photosynthesize but rely on neighbors for nutrition or support, about 4,000 plants species show the characteristic parasitic "what's mine is mine, what's yours is mine" attitude toward the neighbors. Because parasitism appears in so many unrelated plants, scientists think it must have evolved several times. But the kind of full-on parasitism that dodder displays poses special challenges to the parasite. Vines, for example, can run for meters across the ground before they find a tree to climb, but an obligate parasite — which cannot make meaningful amounts of sugar — has limited options, says De Moraes. Dodders, "have no option. If they attach to the wrong host, or do not find a host, they cannot survive." And thus it was not really surprising to find that dodder has a talent for chemical direction-finding, says Mescher. 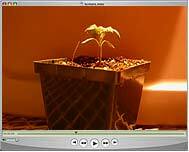 "We would expect it, because this plant has a very hard problem to solve. 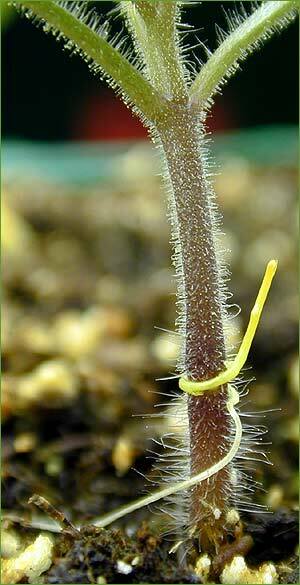 After it germinates, it has a very limited amount of stored resources, and it cannot photosynthesize, so it must very quickly find and attach to a host plant. So it would be expected to have a very efficient host-location mechanism, and volatiles are a likely cue." Chemicals released by host plants may do more than guide growth — they may initiate it. Some scientists think the seeds of other parasitic plants can only germinate in the presence of a chemical emitted by the root of a suitable host plant. Dodder (Cuscuta salina) parasitizing the plant salicornia. Kinda creepy, eh? Photo: Courtesy Collin Purrington, De Moraes and Mescher Labs. Beyond showing how a parasitic plant is attracted to airborne chemicals, the research also showed that odors can be a turn-off for parasites. 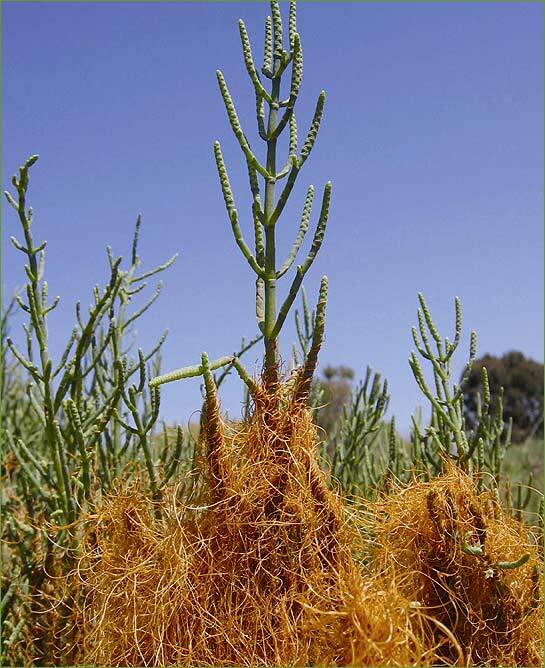 Even though dodder moves toward wheat plants, one isolated component in wheat's "bouquet" actually causes dodder to grow in the opposite direction. That raises the prospect of exploiting a natural dodder repellent as a type of herbicide, says Justin Runyon, a doctoral student and the third author of the article. Scientists have long known that light, moisture, and gravity can govern the growth of plants; now we can add plant perfumes to the list. But many questions remain. For example, exactly how does dodder detect volatile compounds in the first place? Where, in other words, is the parasite's schnozz? • Volatile Chemical Cues Guide Host Location and Host Selection by Parasitic Plants, J.B. Runyon et al, Science, 29 Sept. 2006.